Montreal, located in the Canadian province of Quebec, is a mostly French-speaking city that charms visitors with its charming streets, unique history, and trademark rich French cuisine. The city also has excellent shopping and plays host to several world-class art and cultural events throughout the year. Any time is a great time to visit Montreal, but the city does have four distinct seasons, each with its own variations in climate and weather. Montreal experiences hot, humid summers and freezing and snowy winters. It's not uncommon for snowstorms to dump more than a foot on the city. Spring is increasingly warm and pleasant, albeit short, while fall is a great time to visit if you're interested in spotted incredibly colorful foliage and experiencing cooler temperatures. Early spring in Montreal can be unpredictable, with late-season snowstorms, but by April, the snow thaws and the temperature increase slightly. The city starts to swell with visitors during this time, but don't think that the long, bitterly cold winter is over—temperatures are still very chilly up until May. If you plan on exploring the city by foot, visit in late spring when there's no snow on the ground. What to pack: Spring can see wild variations in temperatures as well as extreme blasts of cold and snow. Bring warm clothing that's ideally water-repellant, as well as closed-toe shoes, an umbrella, and a warm coat. Layered outfits are always a good idea. Summer is a great time to visit Montreal. 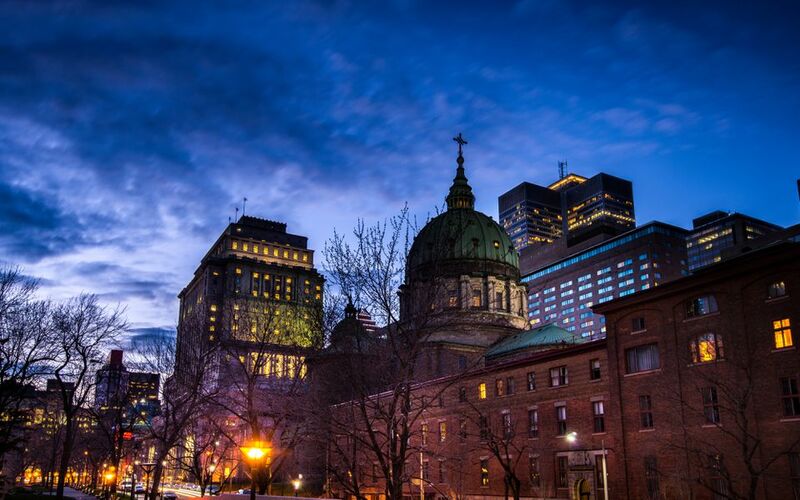 Despite many visitor's impressions of a cool summer after a freezing winter, Montreal can be extremely hot and humid. With the heat index, summer days can feel like more than 100 degrees Fahrenheit! The summer also receives more rain than many expect, with July, in particular, receiving around 11 days of rainfall. What to pack: Given the hot and humid temperatures, avoid packing synthetic fabrics like polyester or other materials that don't breathe. Instead, pack light, breathable fabrics along with a light cardigan for the evenings when temperatures drop. An umbrella is also a must-pack. The weather in Montreal in the fall is wonderful—it's not hot or humid, and yet not too cold either. October, in particular, is an ideal month to visit, with average high temperatures in the mid-50s. September is warmer and busier, while November is cooler and can experience snowfall. What to pack: Prepare for a variety of weather, ranging from warm, sunny days to snowstorms. Bring clothing that you can layer, including long-sleeved T-shirts, sweaters, jackets, and long pants. During the cooler evenings, you'll need a light down jacket to keep warm. As always, walking shoes—ideally waterproof—are a must-pack. Winter in Montreal is long, sometimes lasting well into April. Snow and freezing rain usually begin in December, and the temperature continues to drop throughout January. A strong windchill is common throughout the season, and only the most intrepid travelers should plan on spending any significant amount of time outdoors. December is also the wettest month of the year, experiencing precipitation of some kind nearly half the month. What to pack: Good winter gear in Montreal is paramount. Plan ahead and pack a heavy winter jacket, warm sweaters, and long underwear. You'll also want to bring boots, ideally insulated, a scarf, gloves, and a warm hat. Sunscreen and sunglasses are also important—the sun reflecting off the snow can cause sunburn.